At the end of this page is information on Math Addition Worksheets. But this page also serves as Question 6 of the aMAZEing Math Maze. So, let's work on the Maze first. If you have actually worked through the first 5 questions in the Maze, then you have discovered we aren't fooling around here. This is tough! You Da Man! or Da Woman! - as the case may be. 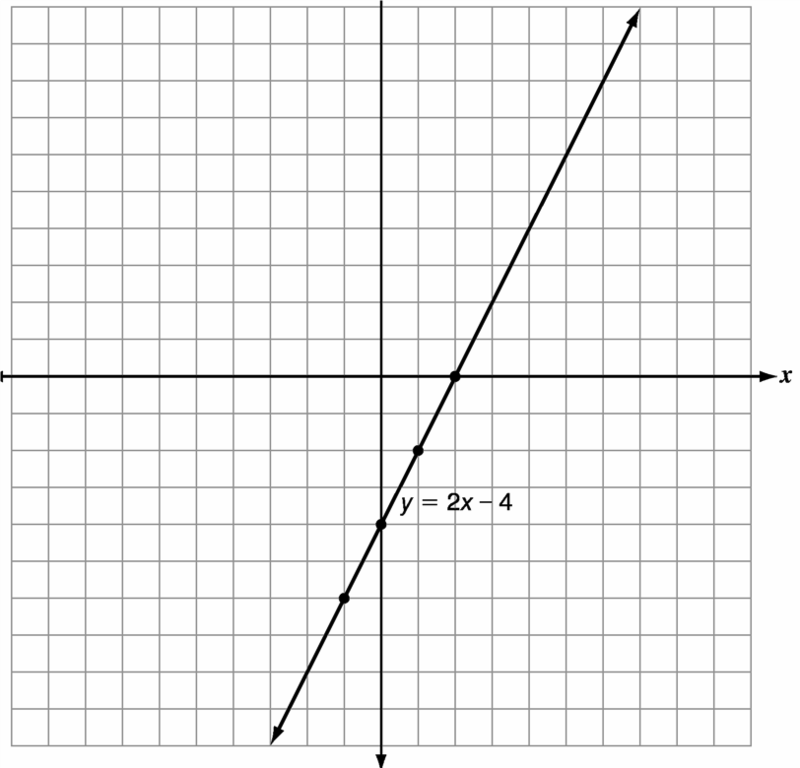 Q6 The graph of y = 2x - 4 is shown below. If the slope of the line is doubled, the new equation is y = 4x - 4. Which of these is a correct comparison of the two lines? a) The x-intercept and y -intercept changed. b) the x intercept and the y- intercept stayed the same. c) The x-intercept changes, and the y-intercept is the same. d) The x-intercept is the same, and the y-intercept changes. A quick thanks to the Missouri Department of Elementary and Secondary Education. Many of the MAZE questions are from their "retired" End-of-Course Assessment questions. To be totally honest, Math Addition Worksheets is a bit out of my field. This site is currently geared towards Algebra 1 and above. There are certainly a lot of really good addition worksheets out there. But it was not my intention to lead you here so that you could keep searching. So, I'll make a recommendation. The plan was to provide a variety of worksheets for all math subjects. But then, I found another site (which is in no way connected to mine). The site is called Math-Aids.com. Here you can get all the worksheets you want. If you'd like to get rid of the advertising and help these folks our - At the time of this writing you can become an ad-free member for $19.95 a year. Pretty cool. Otherwise, you can still get your worksheets with the added bonus of a plethora of advertisements. Hey, everybody has to eat. In a way, I hate competition! But, these guys are really good and it's obvious that they put in some serious time developing this site. Enjoy - but also let me know if there's any problems. Like I said, this is an unsolicited endorsement of a site I know very little about (other than they appear to have nice worksheets). If it should turn out that this site is controlled by nefarious entities please let me know. But, I truly doubt that this is the case. Some day, I may get around to setting up some worksheets of my own, but at present - why re-invent the wheel. Heck, I'm having quite a bit of trouble getting this site done.